In the previous article, I have provided some evidence for how LeBron James has exhibited better longevity and endurance compared to many of his legendary predecessors such as Michael Jordan, Tim Duncan, Magic Johnson, Shaquille O’Neal, and Kobe Bryant. In this article, we are going to take an in-depth look at some of his personality traits, schema and self-concept in order to better understand the factors that have helped him cope with many adversities throughout his career. Self-concept is our own perception of who we are based on our continual interaction with the environment, and our individual interpretation of personal experiences. Not-so-astonishingly, a positive view of self will affect our behaviour and success in a positive manner while a negative self-concept will affect us negatively. Hence, it is important to take the ideas of self-concept very seriously. The ‘Self’ is an ever-dynamic concept that is shaped through every little event, big and small, positive and negative, that we experience in our lives. When our positive experiences outweigh the negatives, we generally have a positive view of ourselves, while the opposite is true in the reverse scenario. So, if we all just ignored all things negative in our lives and focused on the positives, we would all be successful and happy! But real life is not that simple, it is filled with despair and adversities, and there is no shortage of people to discourage us from achieving our dreams. It is never easy to ignore the naysayers or have a constructive interpretation of a bad situation. It takes practice and time to learn how to maximize our gains from positive events and reduce the damage to our self-concept during difficult or unfavourable circumstances. LeBron is someone who has a very strong concept of himself. He knows exactly who and what he is, and no amount of controversies, insults, or hate could change or affect that. He knows exactly how to block out and ignore all the unconstructive criticisms and respond appropriately when he needs to in order to protect his self-esteem. Skip Bayliss couldn’t affect it by pointing out all the flaws in Lebron’s game, Charles Barkley couldn’t affect it by calling Lebron ‘whiny’, even his own idol Michael Jordan could not affect it when he said he preferred Kobe Bryant over James. Skip Bayless, arguably the most famous of LeBron critics, has never been able to get under Lebron’s skin despite all the negative things he has said about him over the years (Gaine, 2017). LeBron never bothered to entertain him with a response. But LeBron does not always sit back and ignore his naysayers. He knows how to strike back when he feels the need to do so in order to protect himself from unfair criticisms regardless of who the criticism comes from. This is not a quality many talented NBA stars possess. For example, when Hall of Famer Kareem Abdul Jabbar questioned Dwight Howard’s basketball IQ, Howard disagreed but appeared quite shaken by Kareen’s comments (Moore, 2013). But the same does not happen with LeBron when he feels he is being treated unfairly. For instance, Charles Barkley made negative remarks about LeBron on numerous occasions which did not sit well with LeBron. LeBron did not sit back. He stood up for himself and reminded Barkley of his own controversial past (McMenamin, 2017). But my favourite moment of LeBron countering his critique was when he responded to Michael Jordan’s comments about how he prefers Kobe over LeBron because Kobe has more championships (Golliver, 2013). This must have been particularly difficult for LeBron given that Jordan, the person he idolized throughout his entire career, prefers Kobe over him. However, LeBron was unmoved, and his response was solid, and to the point. LeBron argued that championships does not always define someone’s career and used some very compelling comparisons suggesting that Bill Russel with eleven rings is not better than Michael Jordan who has six, or Robert Horry with seven rings is not better than Kobe Bryant who has five (Ball Don’t Lie, 2013). In the same interview where he addressed the issue of Jordan preferring Kobe over LeBron, LeBron was asked if it bothers him that Jordan prefers Kobe. LeBron indicated that he is completely unmoved by the fact that Jordan had picked Kobe over him. He said – “I do not play the game or try to define who I am based on what people say, or how they feel about me, it does not matter to me. I go out and I play for my family, I play for my teammates, and I play for the fans, and that’s it”. “My inspiration is the game that I love, I don’t need anybody to pick me or not”. He added. He has so much intrinsic motivation he doesn’t need to seek motivation from uncontrollable sources. It sets LeBron free to play basketball without relying on uncontrollable sources (which in this case is Jordan’s preference) for motivation. And it also eliminates or minimizes unnecessary pressure of having to prove one’s self to people or parties who are not a direct stakeholder to that athlete. LeBron could have easily fallen for this trap set by the questions from journalists, he could have easily taken this as a challenge and said he will get more ring than Kobe and show Jordan who’s the boss. But he didn’t, he chose to remain free by rejecting a challenge that has no real value to his career. LeBron James has been arguably the most celebrated basketball player of the last decade. While arguments can be made as to who is the most popular athlete among the likes of Lebron, Jordan, or Kobe during their prime, there is little debate that LeBron is the most criticized, and famously hated athlete among them. Although LeBron can only blame himself for triggering much of this hate (especially after his display of utter disregards for his fans, and his teammates during his departure from Cleveland in 2010) (Windhorst, 2010), he also deserves much credit for managing himself under heavy criticism and never allowing the hate to get under his skin. LeBron’s most insufferable years began when he moved from Cleveland and signed with the Miami Heat in 2010. 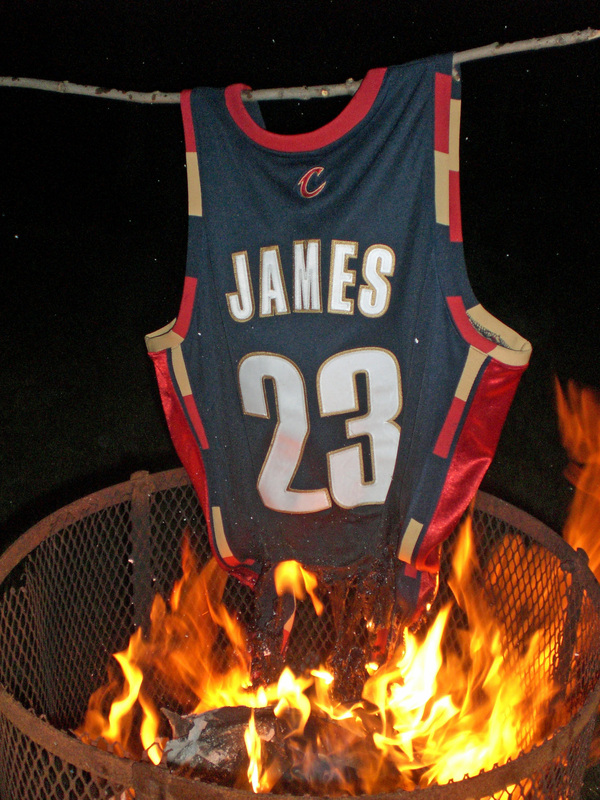 Even as a LeBron fan, I can’t say the backlash against him was fully undeserved. LeBron kept his intent to leave Cleveland a secret from the team’s officials and fans and announced it on a nationally televised interview. This started an unprecedented anti-LeBron sentiment among the NBA fans and LeBron soon became the most hated athlete in the NBA. Although things eventually settled and LeBron was forgiven by most fans in the long run, what remained so astonishing is how LeBron survived those hostile years without ever allowing his haters to get the best of him and won two championships in Miami. One interview that stood out to me best defines Lebron’s ability to protect himself in a hostile environment. It was right after the end of his first season with the Miami Heat when they lost to the Dallas Mavericks in the Finals. He was asked directly by a journalist “does it bother you that so many people are happy to see you fail (Associated Press, 2011)?” LeBron’s response was extraordinary. “All the people that are rooting on me to fail, at the end of the day, they have to wake up tomorrow and have the same life that they had before they woke up today, they will have (the) same personal problems they have today. And I am going to continue to live the way I want to live and continue to do the things that I want to do, be with my family and be happy with them, they can get a few days or few months on being happy about myself and my team not accomplishing their goal but they have got to get back to real world at some point”.